Ever dream of having a darts game scored automatically without using those annoying plastic darts? We decided it was a dream most of us has had at some point, and so decided to implement an automatic scoring system for a “real” cork dartboard. As college students, we found darts to be a great way to pass time and relax. After our sophomore years, we considered ourselves to be fairly serious darts players, and decided to upgrade from an electronic dartboard to a cork dartboard, but were very frustrated by the lack of automatic scoring. Thus, the motivation behind our final project was borne well before we knew our project existed. 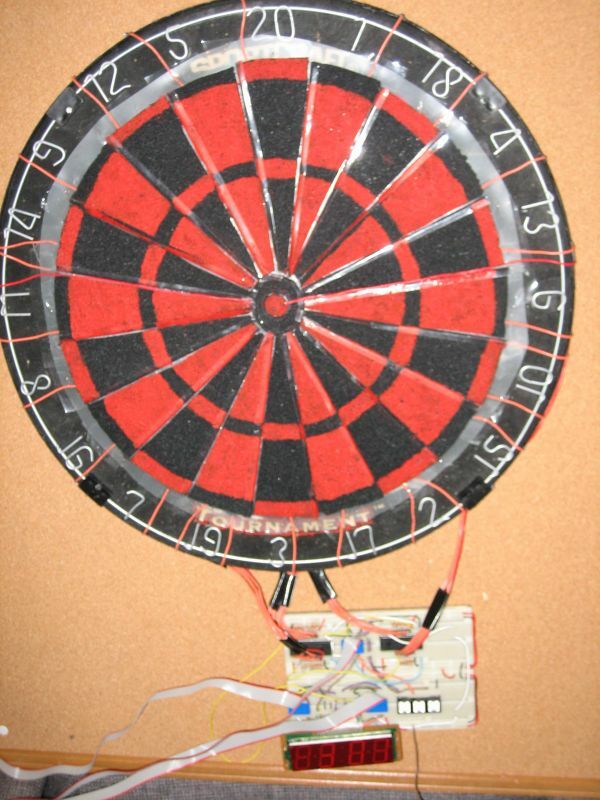 When we saw our darts dream as a possible application of microcontrollers, we did not let the opportunity pass. So, for our project, we designed a “real” electronic dartboard. Score was kept on an alarm clock LED, which we harvested from Curtis’s broken alarm clock. Users were able to play two games on our board: 301 and cricket. We decided to undertake this project not only for our own benefit, but also for the benefit of all those potential darts lovers who are initially intimidated by cork dartboards and keeping score themselves. Curtis owned an electronic dartboard, and Mark owned a cork dartboard, and by our powers combined we made an electronic cork dartboard. We detected darts using two layers of Electrostatic Dissipation (ESD) Foam, a voltage divider network, two 16 to 1 analog multiplexers, and the A/D converter of the Mega 32 microcontroller. The first layer of ESD foam detected which of the 20 numbers was hit, and the second layer detected which of the rings (single, double, triple or bulls-eye) were hit. Players’ scores were displayed on an alarm clock LED harvested from Curtis’s broken alarm clock. Initially, we were amazed that no one had thought of this seemingly great idea first. We imagined that if someone could implement such a dartboard effectively, there would certainly be a market demand. Because there did not seem to exist anything similar to our design, we were not worried about interfering with existing patents or copyrights. There were several major obstacles to implementing automatic scoring with “real” darts. The most difficult obstacle was determining the position of darts accurately. There are 82 separate areas on a dartboard; 20 numbers, each with 2 single areas, 1 “double” ring where darts count for twice their numeric value, and 1 “triple” ring in which darts count for thrice their numeric value, a single bulls-eye (the outer bulls-eye ring), and 1 “double” bulls-eye where hits count as two bulls-eyes. Each of these areas needed to be separated from its neighboring area with accuracy to within a millimeter. A great deal of our design time was used devising a feasible scheme to detect the darts. We threw around several ideas to cross this bridge. Our initial idea was to use three optical position sensors around the board to detect a dart and triangulate its position. But this idea did not come to fruition because the price of our parts was constrained to $50. We found it impossible to find optical sensors with millimeter accuracy over the 18” diameter of a cork dartboard for under $100, let alone three for under $50. Our next idea was to magnetize the darts we threw, and place cheap hall effect sensors on the back of the dartboard to detect dart hits. We knew we could buy Hall effect sensors for around $1, so these initially seemed attractive. The problem with Hall effect sensors is that while they are cheap, they are not accurate. We knew we would need more than 30 sensors to get the accuracy we needed, and with a budget of $50 we could not afford more than 30 sensors. At this point we were stuck and close to changing projects entirely. We talked to Professor Land to see if he had any other ideas. He suggested using two layers of aluminum screen, separated by an insulating sheet of a material like Mylar. Using this scheme, one combination of wedge and ring would be connected at any one time. Using this knowledge, we could feed the voltage to the A/D converter and decode which ring and wedge had been hit. 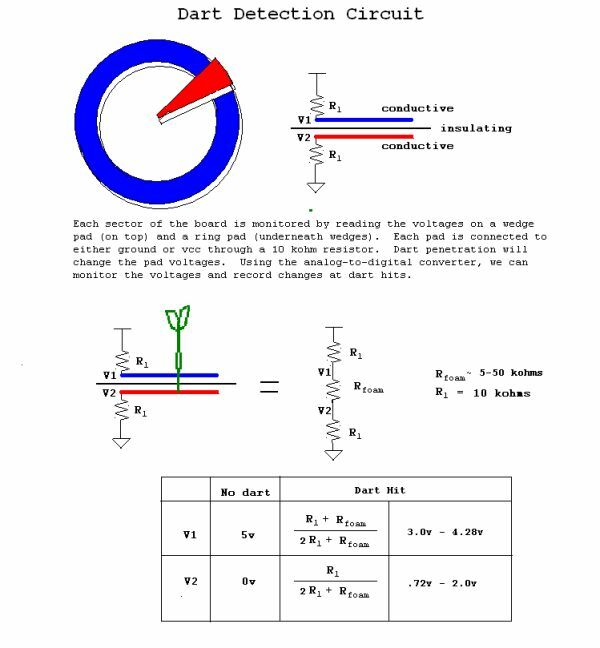 This presented a different problem, though, because with a metallic conductor like aluminum, voltage would either be high or low, and we would not be able to detect two darts in the same number or in the same ring. Still, this seemed like a good suggestion, if we could bypass the conductive nature of the aluminum. When we presented this new problem to Professor Land he suggested ESD foam as a possibility. ESD foam is a foam which has a finite resistance that is not zero. We decided ESD foam would be our best chance to get reliable accuracy on the board without forcing players to throw one dart at a time so we order some from Foamtech Corporation in Massachusetts. This is a schematic of our final hardware design for detecting darts.